10 minute recipe! 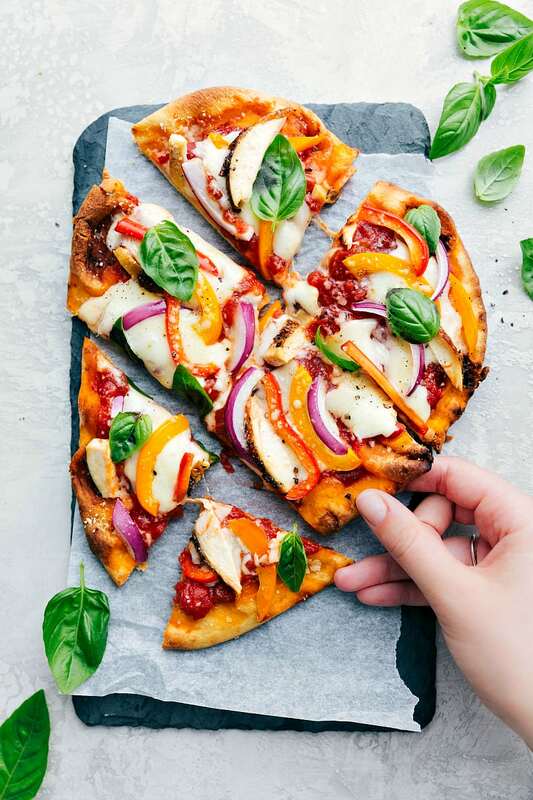 Basil and mozzarella chicken veggie pizza cooked on a store-bought flatbread — easy and delicious! Place the naan bread on a pizza tray (or large tray) and brush the olive oil to coat the crust. Spread the pizza sauce on top of the olive oil on the crust. Chop the cooked/prepared chicken into bite-sized pieces. Slice the bell peppers and red onion. Cut off thin slices of the mozzarella cheese. Evenly top the pizza with the cooked chicken, peppers, onion, and cheese. Bake for 8-10 minutes. Remove and allow to cool for 1-2 minutes and then top with shredded basil and a few sprinkles of fine sea salt if desired. Pizza nights were always the best growing up! I always say its not Friday without pizza…and I LOVE this one! Basil and mozzarella is such a fab combo! Pinned! I love having pizza night!! It makes dinner so much more fun. We used to have it every Friday when I was a kid. Love your fun toppings on this one! This pizza looks so colorful and beautiful! We love pizza night, too! 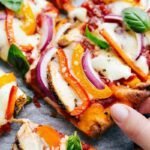 This one looks so tasty, I love the addition of basil and chicken! This pizza looks so delicious! I just love the beautiful color combination. Yay for pizza night! Love all of the colors on your grilled pizza. This will definitely make an appearance at our dinner table real soon :). Pinned! Oh man now you have me craving pizza for dinner! This looks great Chelsea! I had pizza for dinner tonight, but it looked nowhere near as delish as this one. I’m so in love with that quick & easy crust! I feel bad for the kids out there who didn’t have a weekly pizza night. I think if I had to choose, pizza is my favorite thing to eat. SO many different kinds out there. Loving the freshness of this pizza, Chelsea. And it can be made on the grill?? Totally have wanted to try making pizza on the grill before. This recipe intrigues me. Thanks girl, hope you’ve had a wonderful week! Pizza night is the best! 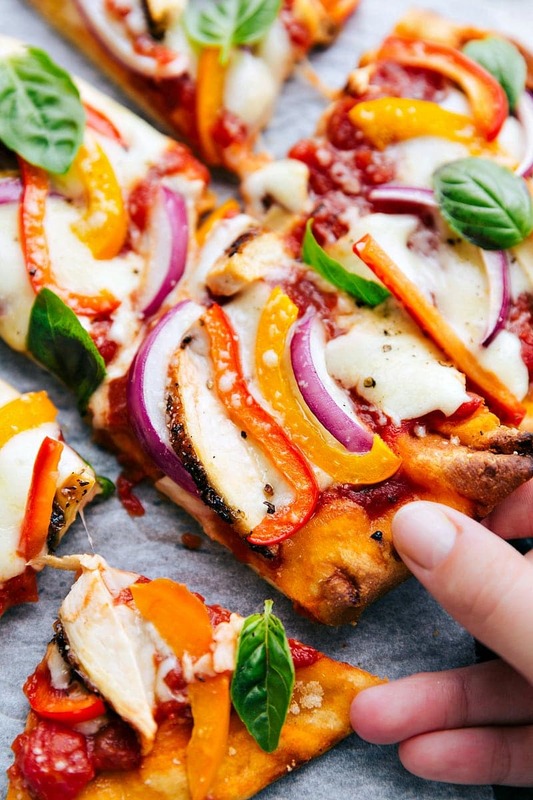 And this looks like one delicious pizza, plus I love how easy it is! I really enjoy having pizza night now that I am a father. This basil and mozzarella looks amazing. I’ll definitely have to give this a try. Your parents raise you well and feed you right! We are a close family too and we love to cook! I’m making pizza right now.